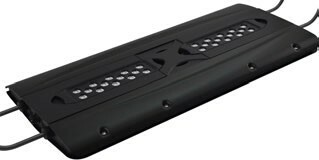 JBJ Aquarium Orion LT-120 LED Lighting On Sale $349.95 Ships Free! 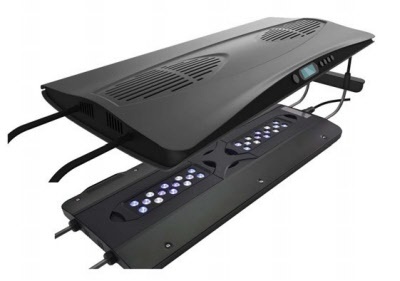 This brand-new LED fixture will bring exquisite colors of your fish and corals in saltwater and freshwater aquariums. It features a variable mode which allows you to change the color spectrum to your desired output. As many of you know freshwater tanks should not have a lot of the blue spectrum as this will cause undesirable algae to bloom inside your freshwater aquarium. If you have a saltwater fish tank this LED light will allow you to increase the blue spectrum which will bring out the colors of your fish and corals as well as provide the vital par levels for your corals. The NEW Orion LT-120 Controllable 120 Watt LED light fixture provides a sleek, contemporary look for your saltwater reef aquarium. Encased in a Fan Cooled Die-Cast Aluminum outer shell and offered in Blue and Black gives you the options to perfectly compliment your home. With its user friendly integrated 24 hr timer, 3 different modes of operations and 6 different settings that you can management via remote. Customize the appearance of your marine fish tank anyway you decide. The 6 different custom modes will allow you to set 1 out of 6 custom settings to light acclimate your corals. Control the LT-120 with the included remote control. Installation is quick easy with the multiple mounting possibilities. Choose between the 5ft suspension kit or the aluminum alloy sliding legs. 120 Watt combination of the latest high performing and high intensity Blues, Royal Blues, Cool White CREE XT-L LEDs, and UV-Semileds that is distributed through 2 channels and powered by a fan cooled Mean Well Driver. The combination of 80 degree and 120 degree optics enables the LT-120 to radiate the LEDs without dark spots or shadowing. levels that will certainly support your light needy aquarium corals. Orion SlimLine 165 Watt LED Light Fixture SL-165 - Ships Free! Orion SlimLine 140 Watt LED Light Fixture SL-140 - Ships Free!